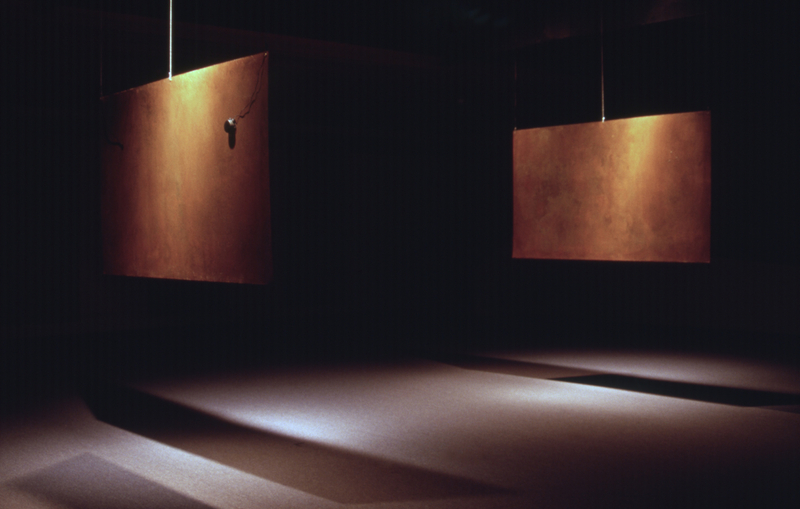 Two large, sound-producing metal plates are suspended from the ceiling. Viewers/listeners move freely around and between the plates to experience a constantly changing sonic and visual environment. Sound from each plate is transmitted electronically to a computer, which in turn processes and returns the signal to the plate. The sound heard from each plate is a combination of the resonant characteristics of the plate and the computer processing of the electronic signal. I originally began experimenting with metal plates as an attempt to introduce "extra-sonic" elements into electronic music composition. By "extra-sonic" I am referring to those elements - physical, cultural, personal - that are often absent when one listens to a piece of tape music. What began as a response to a specific problem in electronic music, the lack of contextual elements, has evolved into my broader interest in investigating the relationship between the visual and sonic elements of sound sculpture. By refocusing attention onto the sounding object itself, this installation prompts us to consider the factors of temporality and mutability involved in its cyclical and continual processes. "surface osculations" involves a dialog between the rich sonic and visual textures of the plates. The viewer/listener's perception is formed as the visual and aural senses inform one another. The timbre of the sounds may be perceived as "metallic," "diffuse,"; these perceptions are enhanced by one's understanding of the physical qualities of the plate, such as the characteristics of its size and surface. The visual elements can be thought of as mediating the sounds and the human cognition of the sounds. Surface Osculations from Ted Apel on Vimeo.